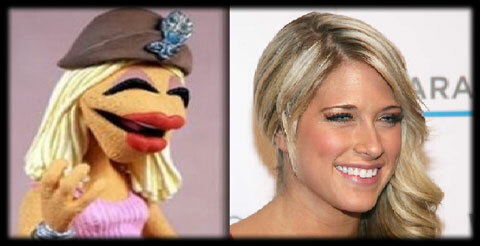 Headlies: KELLY KELLY EXCITED ABOUT MUPPETS COMING TO RAW, REUNITING WITH MOTHER JANICE / “SLATER OR GABRIEL?” BECOMES NEW “GINGER OR MARY ANN?” OF BACKSTAGE DEBATES - WrestleCrap - The Very Worst of Pro Wrestling! Cleveland, OH – Catching up with WWE Divas’ Champion Kelly Kelly after Raw on Monday night, the 24-year-old star was quick to gush excitement over Jim Henson’s world-famous Muppets being booked to perform on the Halloween edition of Raw. The decision to have the Muppets on Raw has been a source of discontent among long time fans, particularly those who bemoaned having celebrities in “guest host” spots on Raw, for seemingly no other reason other than to put forth a positive image for WWE, in light of Linda McMahon’s 2010 Senatorial campaign. Kelly Kelly does not see the correlation between the two ideas. But the arrival of The Muppets provides an interesting bit of reunion for Kelly Kelly, and will allow viewers to see a family come together. Kelly was also asked if Janice would accompany Eve Torres and her to ringside for her match that evening. Dayton, OH – Former teammates, Nexus lackeys, and Corre lackeys Heath Slater and Justin Gabriel are known for many things. Among other qualities, they’re both known for a lack of personality, inability to stand out due to poor writing, and their penchant for being squash dummies for opponents that are actually used to climb the ladder of prestige in WWE. You can add to that list a debate that has sprung up backstage in WWE locker rooms. Both Slater and Gabriel stand out for their rather feminine appearances, especially in a world where raw masculinity and destructive demeanors would be considered pre-requisites. In a traveling symposium that harkens back to the time-tested “Ginger or Mary Ann?” debates from Gilligan’s Island, the backstage co-horts of Slater and Gabriel are now discussing which of the two they find more attractive. And it ain’t the Divas having this debate, either. Others, however, don’t share Regal’s viewpoint on Slater’s stereotypical “red headed” fieriness. Even Jim Ross, the hardened sensei of hyperbole and salesmanship, has gotten in on the debate, even if he can’t decide which of the two comely young men is to his preference. When asked for his opinion on the matter, WWE Chairman Vince McMahon has stated that he has no idea who either man is.